Hawaii Native Status: Introduced. This naturalized fruit tree is native to southern Mexico, Central America, and tropical parts of South America. Description: The slightly fragrant flowers have numerous white stamens and 4 or 5 white petals that are soon shed. The fruits are round to egg-shaped, up to 4 inches (10 cm) long and have persistent calyx lobes, yellow skin, pink flesh, and numerous yellowish seeds. The fruit ripens in the summer. The leaves are leathery, shiny above, and oblong to elliptic in shape with distinctive parallel rows of depressed secondary veins emerging from the midvein. The crushed leaves have a resinous smell. The bark is smooth and reddish brown in color. 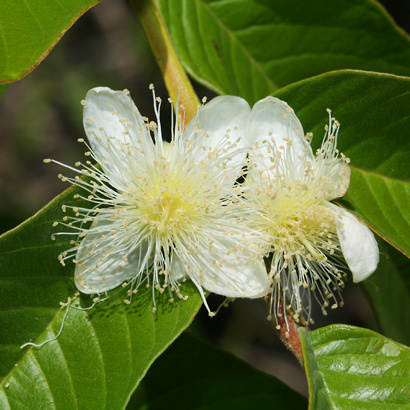 Here in Hawaii, Guava is an invasive, thicket-forming weed in disturbed areas from sea level to around 4000 feet (1219 m) in elevation. 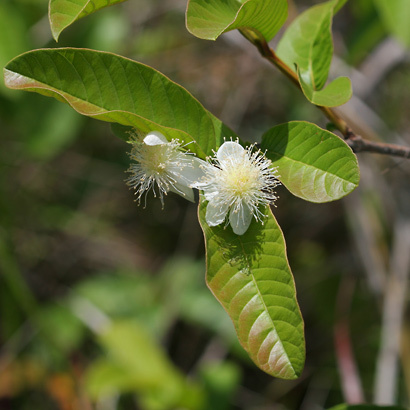 The other Guava species found here in Hawaii, Strawberry Guava (Psidium cattleianum), has smaller, red fruit and does not have prominently veined leaves. 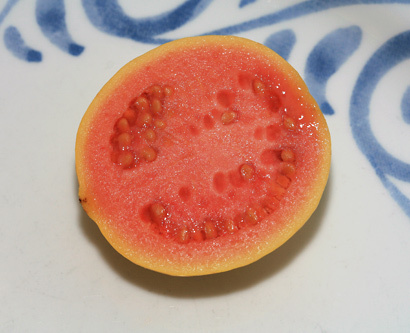 Edible – The flesh of the ripe fruits is edible and quite delicious. The fruit can be eaten fresh or cooked, with or without the seeds, or made into flavorful juice or jelly. Only eat the perfectly ripe fruits since the green underripe fruits are unpleasantly astringent and the soft overripe fruits have a spoiled, rotten flavor. 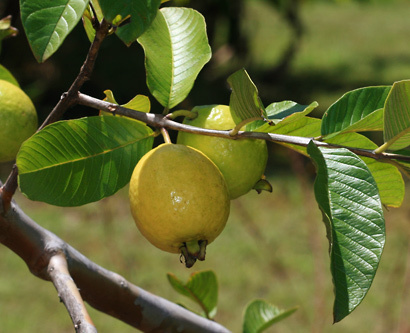 Fragrant – The fruits are highly fragrant with the strong, sweet, musky, tropical fruit scent characteristic of Guavas. A couple of ripe Gauvas in a fruit bowl can scent a room.